MILLIONS FOR PRISONERS HUMAN RIGHTS MARCH was called by prisoners to give voice to their demand: Get rid of the slavery clause in the 13th Amendment to the U.S. Constitution. Amend the 13th! 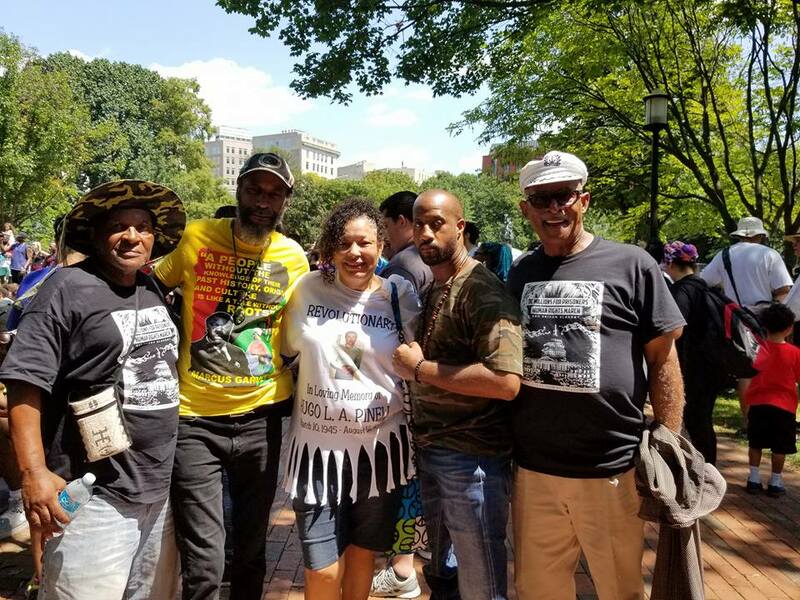 On Saturday, August 19, 2017, people mobilized in Washington DC and at least 16 other cities, including San Jose and Riverside California, demanding the abolition of legal slavery, and calling on people to organize against mass incarceration and abuse in U.S. prisons. Participants addressed the importance of the history of our revolutionary prisoner-led human rights movements. All over the country, people spoke of the great love, determination, and resilience that has kept them carrying on, in the face of extreme state violence, isolation, and family/community fragmentation. • The San Francisco Bay View posted this report (with photos & videos) about the Millions for Prisoners Marches that took place on August 19th around the country. • Nube Brown of California Prison Focus and Rise Up for Justice was a main organizer for the San Jose March. On a sunny Saturday, August 19, 2017, people across the country gathered, marched, and rallied in solidarity to support prisoners human rights and amending the 13th. What an audacious and loving act! Hundreds gathered in San Jose, CA at Raymond Bernal Jr. Park, where we kicked off the march with a recorded speech by founding member of the Amend the 13th campaign, Heshima Jinsai (Denham). Followed by Troy Williams of SF Bay View setting the tone for a peaceful march. As we marched and chanted “Brick by Brick, Wall by Wall, We Will Make your Prisons Fall” and “Human Rights Apply to All, Even Those Behind a Wall,” this prisoner-inspired call to action united our community on both sides of the prison walls to join the momentum of the New Abolitionist Movement. Patrons of restaurants, folks on foot, trains, and cars we passed along our route stood to applaud, cheer, and honk their support and encouragement. The beautiful 1.3 mile route through the Japantown neighborhood led us to the James P. McEntee Plaza just across from the county jail where Michael Tyree had been murdered by three guards, only two years before. Watani Stiner, despite decades of incarceration and abuse, welcomed the rally participants with exuberance, love, and inclusion, setting the stage for stories to come. We stood in rapt attention as Raymond Aguilar shared his experience of juveniles sentenced to life without parole. Julia Arroyo, on behalf of Mianta McKnight brought to light the lack of resources available to those returning home, especially to girls and women of color. Laurie Valdez spoke on the murder of her young child’s father at the hands of San Jose State University police. One by one speakers continued to share their lived experience. We encouraged and cheered the speakers, who moved us to anger and sadness, and also motivated us with words of hope and possibility. As we engaged in the dynamic of giver and receiver we created a bond of shared humanity. We were called to listen and to act. And together we closed the rally committed to the work to come. In unity, we will become stronger, more dedicated, and more resolved. We stand firm in our belief that all people, including those incarcerated and formerly incarcerated, deserve their Human Rights. We stand committed to the New Abolitionist Movement to end slavery in America once and for all. We take this opportunity to express our support for this historic event that supports prisoner’s human rights and to amend the 13th Amendment’s slavery exemption clause, so that legal slavery is finally abolished. When you consider the historic application of slavery in America, slavery in any form should not be tolerated in our society. For years we have struggled to defend the civil and human rights of prisoners both during our incarceration and upon our reentry back into our respective communities. We took to heart the principles that were espoused by Comrade George Jackson. We came to prison as criminals but while here we transformed ourselves into revolutionaries so when we return to our communities we can be productive and make meaningful contributions for the betterment of society. For years we endured indeterminate periods of isolation and sensory deprivation so we know firsthand the inhumane and barbaric treatment that one can be subjected to while in prison. Yet those experiences have not dampen or diminish our resolve to fight for the human rights of those confined to these prisons. As a society, we want to see healthy and wholesome individuals returning to society upon their release from prison. The inhumane and barbaric treatment that one can experience, indeterminate periods of isolation, and sensory deprivation is damaging to an individual’s mental health and physical well being. It is dehumanizing and must end. Therefore, it is incumbent on us to raise our voices in defense of prisoner’s human rights. This is the way we express our HUMANITY!! Long Live the Indomitable Spirits of Comrade George Jackson, Hugo “Yogi” Pinell and all Fallen Comrades. Black August Resistance Forever!! Photo from SF Bay View: Albert Woodfox of the Angola 3 was held in solitary confinement in Louisiana prison for 44 years. He was a speaker at the main march across from the White House. Albert is here with Laura Whitehorn, who also spoke, and is a former political prisoner who works for the release of political prisoners and elder prisoners. Photo from SF Bay View: At the Millions for Prisoners Human Rights March and Rally at the White House, three legendary organizers came together: Ramona Africa of MOVE, the only adult survivor of the 1985 bombing; Kilaika Kwa Baruti of George Jackson University; and Krystal Rountree of IAMWE, a principal organizer of the march in DC. • Solidarity in San José with Millions for Prisoners March in DC Bradley Allen on IndyBay; with history, photos, and video. • As a nation grapples with white supremacy, the Millions for Prisoners March comes at the perfect time -Jared Ware in SF Bay View; includes many photos, art, and references. • Florida locked down all 97,000 prisoners, blocking them from Aug. 19 Millions for Prisoners Human Rights March. Fearing the peaceful organizing from prisoners and people outside, the Florida prison system (the 3rd largest to CA and Texas) put all its captives, more than 97,000 prisoners, across the state of Florida on indefinite lockdown. Coincidence? Florida’s prison system, as of a recent secret and retaliatory interstate transfer, currently holds captive the revolutionary and prolific writer and artist, Kevin “Rashid” Johnson, who exposes and publicizes abuses in U.S.prisons.